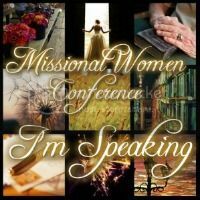 Last week, I shared my story and passion for discipling unchurched women. I won’t rehash it here, but will simply say God has repeatedly planted our family in places with hard soil – places where it is difficult for the gospel to take root. But regardless of where you live – whether it’s the Bible belt or beyond – the condition of the fields in which our churches are seeking to sow and grow the gospel are rapidly changing. WHAT IS AN UNCHURCHED WOMAN? Western culture is becoming increasingly unchurched – comprised of individuals who aren’t affiliated with any church. Consider these stats from the Barna Research Group concerning American adults. In 2014, it found that 45 percent of Americans were unchurched. That figure is up from 33 percent in 2003 and 30 percent in the 1990s. So, the number of unchurched individuals in America is increasing and this trend is only gaining momentum as we shift farther and farther from our nation’s Judeo-Christian roots. Specifically, women are a key component of this cultural shift away from church or Christianity at large. 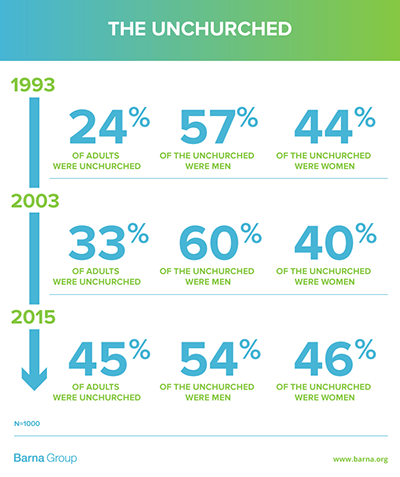 Ten years ago, more men were unchurched than women. Today, the gender gap has closed from 20 points to 8 points. 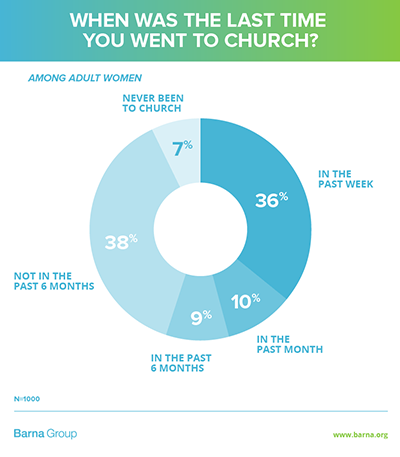 In fact, Barna says a large number of unchurched women are actually “de-churched.” The majority of unchurched women (85%) haven’t attended church in 6 months or more. So, it’s not simply that these women are unreached – that they haven’t heard the gospel or been exposed to it – but somewhere along the way they decided church wasn’t for them and unplugged altogether. WHAT DOES AN UNCHURCHED WOMAN LOOK LIKE? Lacking a church home means more than simply not attending church, it also includes the concept of lacking a church background. Unchurched women are very often from families who have remained unchurched for generations. Their home life offers them little to no support for spiritual realities and often they have few to no life examples that model healthy relationships or wise living. 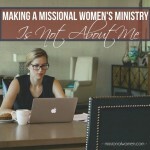 How this impacts discipleship: Because the chances are high that unchurched women are from broken homes, believers from an unchurched background will need help grounding their identity in Christ rather than their roles, successes, failures, works, affiliations, acclamations, preferences, or personalities. Additionally, they will need help finding their place in the church, understanding how the body of Christ operates, and what constitutes heathy and fruitful living. They will need to be challenged to count the cost of Christian service. They will need to taught kingdom realities and what part their lives play in bringing that kingdom to bear through the church. Unchurched women have neither studied the Bible nor read it at any length for themselves. Even more likely, they do not own their own copy of the Bible. I met a 70-year-old woman, who despite growing up in a non-evangelical church, never owned a Bible. She was bright and funny and full of life, but lacked any sort of Bible knowledge. When she first opened the Scriptures, she couldn’t find Genesis 1:1. For this reason, when she started studying the Bible, she had to learn how the Bible was put together, not simply what it said. The seismic transition from paper to the digital world makes this loss an even greater reality. Many individuals simply use their phone or google to look up information. If pressed to look up a Bible verse, they will have no framework for the unity of the Scriptures or the underlying story it presents. How this impacts discipleship: Discipleship, then, cannot consist solely of best-selling Bible studies. It must include more than what the Bible says about certain topics, specifically how to view the Bible, how to read the Bible, why the Bible is trustworthy and important, and how the different parts of the Bible fit together. Churches will need to go back to the basics and explain the gospel and its implications for daily living as if they are speaking to someone who doesn’t share their heart language. The biggest discipleship obstacle you’ll find when facing biblical illiteracy is the assumption that a disciple understands what they are learning. 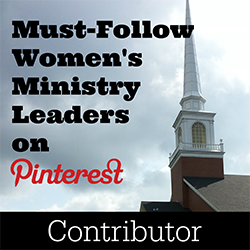 Another hurdle churches will face in discipling unchurched women is their lack of a shared worldview. Instead of a biblical worldview, unchurched women will possess one of the following worldviews (or a synthesis of them). How this impacts discipleship: Individuals who lack a biblical worldview will have a loose understanding of creation and sin. Discipleship, then, cannot begin with the story of the cross; it must begin where Scripture begins and explain how sin came to be and the full range of consequences sin brings. Churches will need to disciple according to the entire story of the Bible (creation, fall, redemption, and restoration) to shape a disciple’s worldview around the Bible. 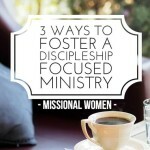 Probably the biggest change churches or women’s ministries can make right now in how they disciple unchurched women is to throw out all those to-do lists that comprise most discipleship material (go to church, title, pray, read your Bible, etc.). Those activities are important, but they place emphasis on the fruit of salvation (behavior) before a new plant has firmly taken root (heart transformation because of Christ). Instead, churches must help guide believers as they filter their current beliefs through the prism of the Scriptures, allowing the Spirit to convict their hearts, prompting true and lasting heart change. True discipleship seeks to bring the gospel to bear on a person’s total life. This is particularly true for women who come to Christ from a legalistic or tradition-based religion. This doesn’t mean we set aside obedience – far from it! It simply means we are careful not to neglect the gospel in lieu of works. Because these women lack a church home, a church background, Bible knowledge, and a biblical worldview, they will also very likely lack gospel exposure. Even if a woman grew up in a non-evangelical tradition and knows about Christ, her understanding of the gospel very likely will prove incomplete. She might have heard the good news and rejected it on multiple occasions. If she is from a pluralistic religion, she will consider Jesus to be a good teacher among many religious figures. If she is from a secular background, she will have been taught that parts of Christ’s story are myths (such as his virgin birth and resurrection). How this impacts discipleship: Lack of gospel exposure will most certainly mean unchurched women will be surrounded by layers of strongholds and sin, perhaps even generational sin since she is very likely to come from an unchurched family. Discipleship structures will need to address the reality of the spiritual battle ahead of these women when they commit their lives to Christ. They will need to learn how to bring the gospel to bear on each area of darkness in their lives and how the gospel frees them to live in Christ. Discipling unchurched women starts with the gospel and continues as they are increasingly rooted in its truth. Traditionally, discipleship emphasizes the bearing of fruit – the transformation into the image of Christ. Spiritual fruit, then, is the evidence that God is changing us into the healthy creation we were intended to be from the very beginning through his Spirit. However, discipling unchurched women looks differently from those who have grown up in the nutrient-rich soil of a churched culture. 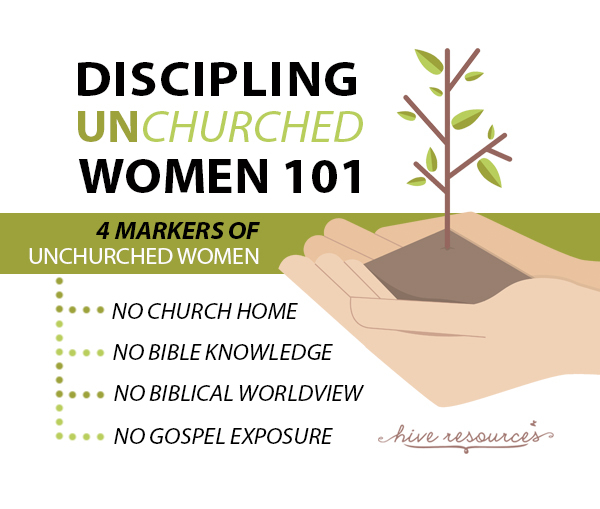 Discipling unchurched women is first and foremost, a root-building ministry. When we disciple unchurched women, we must first ensure they are firmly rooted to the church and the gospel. If we do not adequately address the roots of their faith, their fruit will be short-lived. After their first initial growth spurt, the heat of life will scorch them and they will wither away. If you are a women’s ministry leader, very soon you will have to consider how your church or ministry team can best engage unchurched women with the gospel. Next week, we will look at the root-building discipleship process for these women so they might remain securely anchored in the hope of the gospel. I hope you’ll join me! 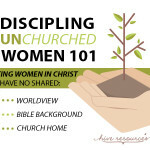 Very interested in getting more knowledge about discipling Unchurched Women! I can’t wait to read more! I love on teen moms and their kidos and I have seen all the above. I find it very challenging to go deep as a group with such different unchurched backgrounds. This series will help with talking points when training my leaders. Do you have suggestions of material to help walk a teenmom group through Creation, Fall, Redemption and Restoration? Hi Melissa, I found this article very interesting, I just started the women’s Ministry in my church and I would like to know if I could copy and translate it into Spanish, I had never seen the ministry in this way, thank you for sharing what God has given you God bless you and I await your response.